Turkish police stopped people from gathering in large numbers for LGBT pride in Istanbul on Sunday, but smaller groups made impromptu press statements defying a ban imposed by the governor. 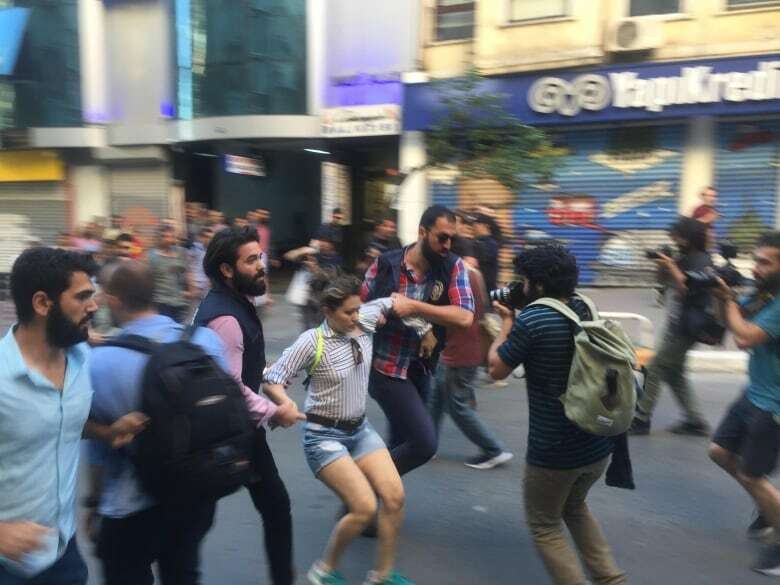 Turkish police stopped activists for lesbian, gay, bisexual, trans and intersex rights from gathering in large numbers for LGBT pride in Istanbul on Sunday, but smaller groups made impromptu press statements defying a ban imposed by the governor. 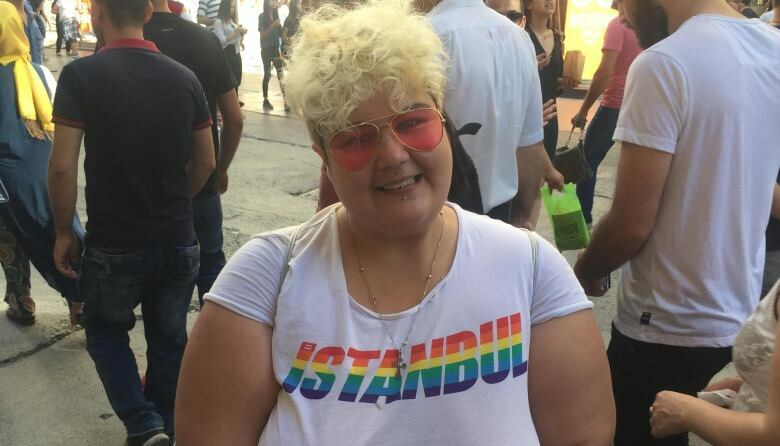 Organizers of the 2017 Istanbul LGBTI+ Pride had vowed to march in central Taksim Square, using a Turkish hashtag for "we march," despite the ban on gay pride observances ordered by the Istanbul governor's office for the third year in a row. 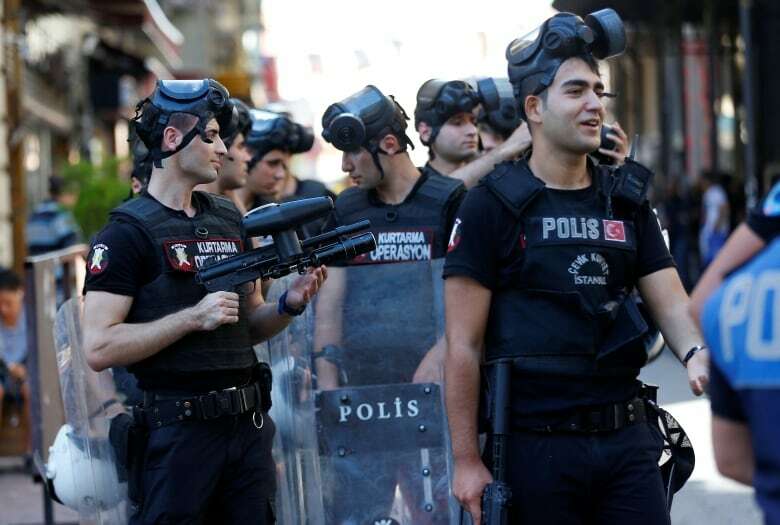 Police established checkpoints in the area, preventing groups from entering Istiklal Avenue and turning back individuals who were deemed to be associated with the planned march. Small groups assembled on side streets were chased away by officers. At least a hundred protesters gathered in a nearby neighbourhood, beating drums and chanting slogans such as, "Don't be quiet, shout out, gays exist!" and "Love, love, freedom, State, stay away!" They carried a banner that read, "Get used to [it], we are here." Police used tear gas to disperse the crowds and activists said plastic bullets also were used. Riot-control vehicles and buses were dispatched to the area. Turkey's official Anadolu news agency said "an estimated 20 people" were detained after protesters did not heed warnings to disperse because the march did not have a permit. Among those detained was Associated Press journalist Bram Janssen, who was covering the events. Footage from the scene showed officers grabbing him by the arms and escorting him to a van. The AP was trying to establish the circumstances of his detention. In banning the event, the governor's office on Saturday cited safety and public order. It also said a valid parade application had not been obtained for Sunday's event, a claim rejected by organizers. The governor's ban referred to "serious reactions by different segments of society" as several nationalist and religious groups called for the march's cancellation. Pride organizers said in a statement Sunday that the threats themselves should be dealt with rather than limiting demonstrations. "Our security will be provided by recognizing us in the constitution, by securing justice, by equality and freedom," the statement said. LGBT activists have lobbied unsuccessfully to have sexual orientation and gender identity covered by Turkish laws protecting civil rights and prohibiting hate speech. Homosexuality has been legal in Turkey since the republic's founding more than nine decades ago. The Turkish government says there is no discrimination against LGBT individuals and that current laws already protect each citizen. It also insists that perpetrators of hate crimes are prosecuted. Turkish authorities allowed pride marches to take place for more than a decade since the first one was held in 2003. Up to 100,000 people attended Istanbul Pride in 2014. But in 2015, police dispersed crowds using tear gas and water cannons after a last-minute ban. In 2016, amid a spate of deadly attacks blamed on ISIS or on outlawed Kurdish militants, the event was banned again but participants still tried to gather. Pride organizers think the celebrations have been banned since 2014 because they coincided with the holy month of Ramadan and a rise in conservatism. Sunday's scheduled march was on the first day of the Eid al-Fitr holiday, marking the end of a month of fasting.